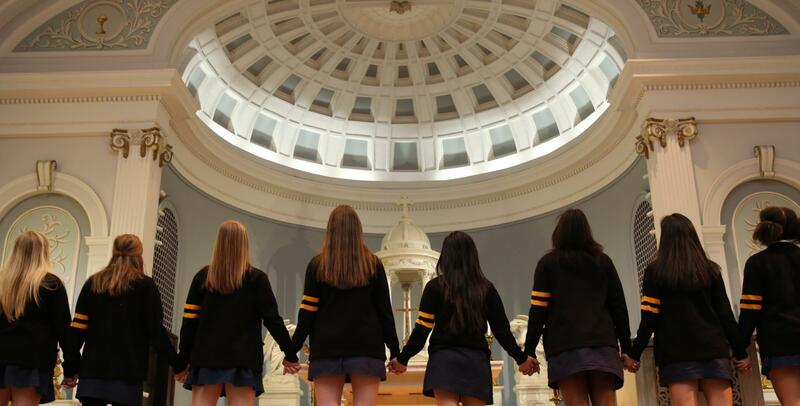 The Campus Ministry program at Saint Ursula Academy is where the religious activities are coordinated and implemented. Students are able to learn more about themselves and their gifts through prayer, worship, reflection, and annual retreats. One goal of the program is to encourage students to become strong leaders in their faith communities as well as the global community. Liturgies occur monthly and are planned and implemented by The Campus Ministry Council, a student organization. Students are trained as Eucharistic Ministers and Lectors and student musicians provide the worship music. Special Class Masses are held in the beginning of the school year in our beautiful Chapel. Prayer services are held to celebrate the different liturgical seasons of Advent and Lent, including Reconciliation Services for each class with the opportunity to go to confession. We also celebrate the Feast Day of St. Angela Merici, the foundress of the Ursulines. Spiritual Journey Week is a time for all of faculty and students to focus on our spiritual growth and education through activities outside of the classroom. The Freshmen and Sophomores spend the week with a focus on community service opportunities, Ursuline Heritage, and diversity. Juniors participate on an overnight Retreat and in a recommitment service to their Academy Alum goals that they discerned as Freshmen. Seniors make their Kairos retreat at some point at the end of their Junior year or in their Senior year and come together for a special 4th day prayer service. Seniors provide support for the underclasswomen by organizing activities and participating in other events. The end of Spiritual Journey culminates in a day of reflection and Closing Liturgy. This schedule includes Mass, Prayer Service and Reconciliation dates and times.